In medieval times, famous masons competed to build the most beautiful and impressive cities. As we can see from what they left behind, they were perfectionists, but each had his own ideas about the best ways to design cities. Stately government buildings stand next to noble palaces with massive walls and guard towers surrounding the city to protect it from its enemies. In this beautiful game, the players take the rules of these master masons of old. At the beginning of the game, the board is empty, but quickly fills with houses, palaces, towers, and walls. The guild cards help guide the masons in their building and the special dice offer them the materials they need. Each player decides where to build his houses and palaces. Whenever walls enclose a city, it is scored. The game will determine which mason makes the best use of his materials and guild cards. 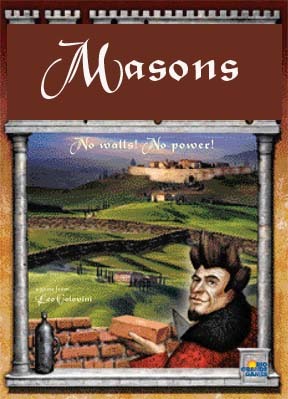 But that will not be known until the final scoring, when the final scoring is complete and the players learn which of them has scored the most points to earn the victory as the greatest mason! At least for this game! Mason - no walls, no power! This game has a lot going on. It only takes about 45 minutes to play, and it provides lots of tactical and strategic options, due to the mix of cards and dice rolls. Components are great too.